An aromatic perennial shrub native to Mexico and the Southwestern United States. 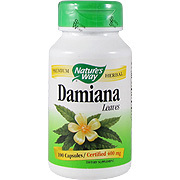 Damiana has been used by herbalists as a tea. Nature`s Way Damiana is gathered from the wild in the deserts of Mexico, the source recognized as the finest quality. 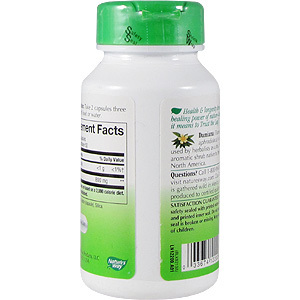 Take two capsules three times daily, preferably with food. Damiana (leaves) 800mg, Gelatin, Water. 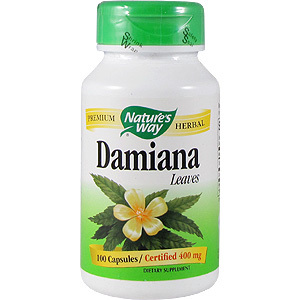 Damiana Leaves is shipped in a discrete, unmarked package. Orders are processed immediately and usually take about 3 to 5 working days to be received. We do ask that you try it for 2 to 3 weeks to feel the full effects. Any information received is used only for order processing and shipping purposes. Your information, such as e-mail address, will never be disclosed to a third party.